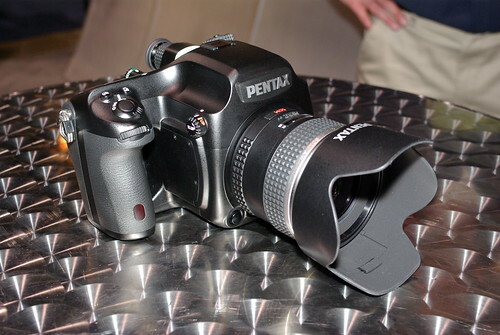 After many delays, Pentax introduced this medium-format digital SLR in March 2010. It boasts a 40 megapixel CCD sensor manufactured by Kodak. At the time of its introduction, the Pentax 645D was many thousands of dollars cheaper than other 40 Mp medium-format cameras on the market. In 2014, Ricoh Imaging introduced the Pentax 645Z. 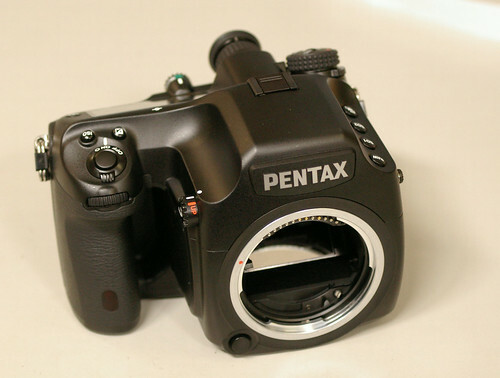 The name "645D" signifies that the camera may use lenses designed for the Pentax 645 film cameras. However the D's actual sensor size is 44 x 33 mm leading to a "crop factor" of 1.27x compared to using lenses on their original 56 x 41.5 mm film format. At the time of introduction, only one 645D-specific lens was available, the Pentax-D FA 645 55mm F2.8, a standard lens whose focal length exactly matches the digital image diagonal. ↑ "No Lens Left Behind", formerly published at the Kodak blog Plugged In (archived). This page was last edited on 24 November 2017, at 06:47.